FS Templates have just released FS Turphany. This theme is intended for travel theme websites but if you're looking to freshen up your site with a colourful design this template might be what you're looking for. The theme has a CSS table less design, is valid XHTML and CSS and comes with a one, two or tree column layout with seven collapsible module positions. The theme comes in two different colour variations and the package includes the .psd Photoshop source file and and five header images. 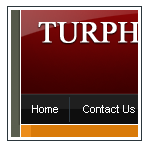 Visit FS Templates for more information and demo of FS Turphany.